GREENSBORO, North Carolina -- North Carolina still looked at home Sunday, even as it played what was supposed to be an Atlantic Coast Conference home game roughly 50 miles from its arena. "It's a different environment and a different situation than you'll probably ever have to really do," Jackson said. "But I thought we really grinded it out even on a night when we didn't shoot the ball too great." The postponement came Friday after the water system supplying the UNC campus and surrounding area instructed its 20,000 customers not to drink or use the water due to critically low supplies, brought on by a water-main break and the shutdown of a treatment plant. But the Tar Heels (21-4, 9-2 ACC) still had a loud home-state crowd filled with blue behind them in a venue where they've played 143 times - most coming during the 26 ACC Tournaments hosted here. The Tar Heels spent Friday night in Durham - home to rival Duke - and then stayed in Greensboro on Saturday night. "It just threw us off, having the extra day to practice," junior Joel Berry II said of the team's routine. "We watched so much film, the same film, the last two days. I'm just tired of watching it." The Greensboro Coliseum had hosted a country music concert Saturday night, giving arena officials a short turnaround to have the building ready for tipoff. Still, the game had a familiar feel despite its unexpected location, down to the fact that Notre Dame beat UNC here nearly two years ago to win the ACC Tournament for its first basketball championship in any league. In that game, Notre Dame rallied from nine down for the 90-82 win. On Sunday, the Fighting Irish (17-7, 6-5) trailed by 15 midway through the second half before climbing back to within 75-73 on V.J. Beachem's 3-pointer from the corner with 3:47 left. But Berry answered with a jumper at the 3:33 mark to start an 8-0 run and turn away the comeback. "Yeah, we were talking about it - I was talking about it," Notre Dame coach Mike Brey said of the 2015 comeback. "I said, 'Fellas, this is the same feeling, we've been here before. It has the same feeling. I think we're going to have a chance at that thing. And we did, we made a run at it. "But Berry's (shot) was the shot of a big-time veteran guard who's had a great year, to kind of stop any belief for us." Notre Dame: The Fighting Irish started 5-0 in ACC play, but they've lost five of six to stumble into February and slide toward the middle of the league standings. 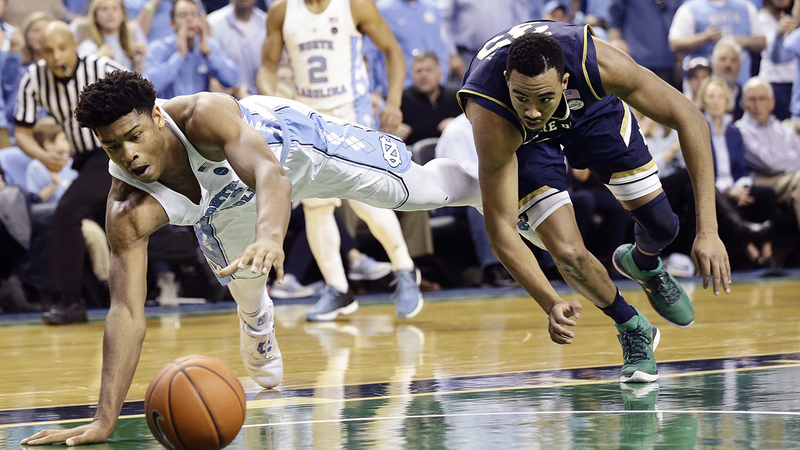 UNC: It wasn't always pretty as UNC struggled to hold its lead, but the Tar Heels sit alone in first in the league standings. Beachem finished with 20 points while Matt Farrell had 18 for Notre Dame, which shot 45 percent and made nine 3-pointers. The Tar Heels dominated inside against the Irish's smaller lineup. They finished with 40 points in the paint and took a 44-25 rebounding advantage that led to 19 second-chance points. Kenny Williams III finished with 11 points and three 3-pointers as one of six UNC players in double figures. He had a combined 11 points in his previous four games. "Those were big plays that he made for us today," UNC coach Roy Williams said. Notre Dame: The postponement didn't help the Fighting Irish, who have a short turnaround to host Wake Forest on Tuesday. "Quite frankly I'm disappointed that the game Tuesday wasn't moved to Wednesday," Brey said, "but I signed up for the ACC, so I'm a good soldier." UNC: The Tar Heels renew their rivalry with No. 21 Duke on Thursday night, traveling to Cameron Indoor Stadium.